Souper Jenny's Zadie Project sets the right tone for the High Holidays' Operation Isaiah. 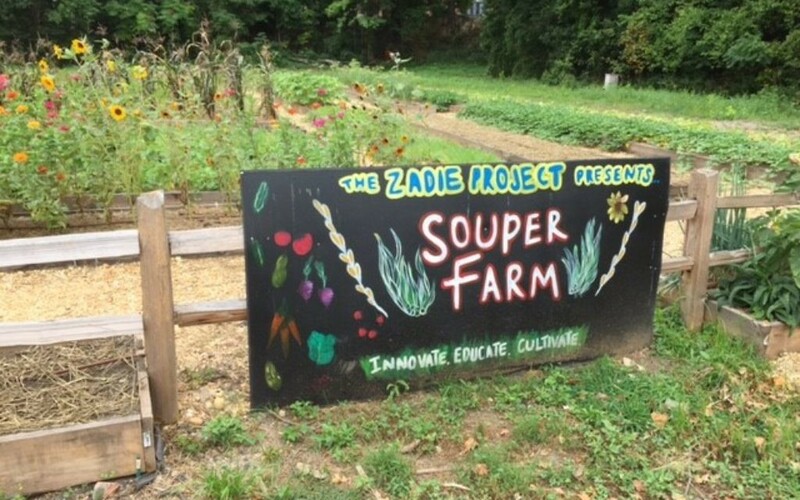 The 1-acre Souper Farm supplies produce for Zadie Project soups. This column begins at the intersection of turkey chili, undernourished children and the Broadway musical “Falsettos” and ends with the Jewish High Holidays. The chili is the signature dish of Jenny Levison’s restaurant chain, Souper Jenny. The recipe came from her father, 90-year-old S. Jarvin Levison, a founding member and past president of the Breman Museum, who last year retired after a decades-long legal career. He also inspired his daughter’s creation last October of a nonprofit, the Zadie Project (zadie is Yiddish for grandfather). Every day teachers see the effects of inadequate nutrition on children who have difficulty paying attention or completing assignments. That’s where the turkey chili comes in. A portion of the proceeds from every bowl sold goes to the Zadie Project, where it funds the production and delivery — through after-school programs at Title I schools, which have a high percentage of students from low-income families — of 300 quarts of soup a week, the equivalent of 600 meals. “They basically get fresh, homemade, healthy soups to kids that aren’t getting a dinner meal,” Levison said. Along with the chili, the soups include chicken, vegetable and white bean with chicken sausage. “We’re constantly looking for partners who fit in that mission, where the kids are in school and parents are working but they’re still sort of on the edge of making it financially,” she said. Her goal is to distribute 1,000 quarts weekly. 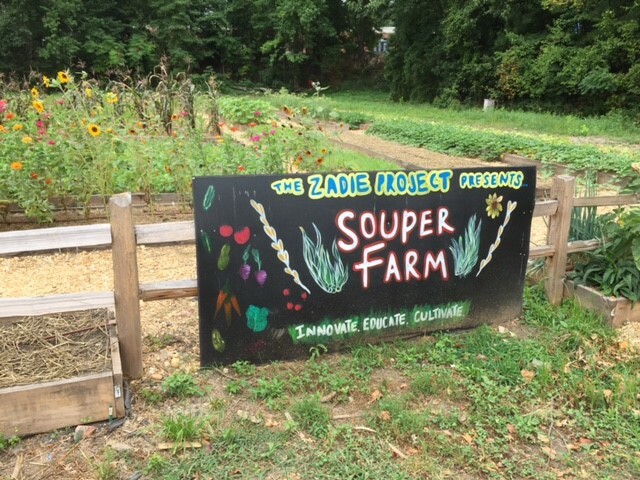 An important piece of the process is the Souper Farm, a 1-acre plot behind the Souper Jenny on the west side of Atlanta, where produce is grown for the Zadie Project soups. “The next piece is, we’re starting an educational program to teach people not only about the importance of eating fresh food, but how you can grow your own food in any environment,” Levison said. “Falsettos,” a musical about a dysfunctional Jewish family, premiered in 1992 and was nominated for seven Tony Awards, winning best book of a musical and best original score. A revival on Broadway netted five more Tony nominations this year. 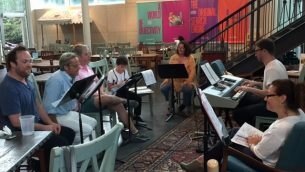 Levison, a veteran actress-turned-restaurateur, is producing performances of “Falsettos” on consecutive Sundays, Sept. 17 and 24, at the Atlanta History Center. Tickets for the Zadie Project benefit can be purchased on the Souper Jenny website or via EventBrite. On recent evenings, the dining area of the Souper Jenny at the Atlanta History Center has become a rehearsal space. In addition to Levison, the performers are Mitchell Anderson, Kandice Arrington, Craig Waldrip, Adam Levinthal, Wendy Melkonian and 12-year-old Dov Karlin (who, like the character he plays, is prepping for his bar mitzvah). The “Falsettos” performances are just one reminder in this High Holiday season that hunger merits attention year-round. Since I wrote about it in February, the Jewish Family & Career Services food pantry, the only kosher pantry in Atlanta, has moved into larger quarters. In 2016, JF&CS distributed 22,000 pounds of food to 750 households, feeding about 2,200 people. The JF&CS pantry, which serves anyone in need, not only Jews, benefits from the Operation Isaiah food drive coordinated by the Atlanta Community Food Bank. Now in its 27th year, Operation Isaiah has collected more than 1 million pounds of nonperishable food. Volunteers cull the kosher items for the JF&CS pantry. ACFB last year collected 70 million pounds of food, which its 600-plus client agencies distributed to more than 755,000 people, the equivalent of some 57 million meals, in the 29 counties it serves. The blue Operation Isaiah barrels serve as collection points for 23 congregations, as well as several day schools and other Jewish organizations. This year’s drive begins Sept. 18 and concludes after Sukkot, which is Oct. 4 to 11. So, eat some turkey chili, enjoy the songs in “Falsettos,” and, please, fill those Operation Isaiah barrels.